Offer a complete management tool to your drivers including time reports, ecodriving reports, messaging, missions etc. 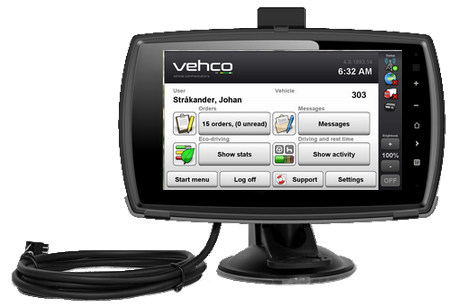 With Vehco Vision, your drivers benefit from an easy-to-use, solid and modern screen. The driver application is based on an Android client, where the drivers get all the information they need about their missions, their driving behaviour and their driving times. They can also use it to send detailed reports on their activities or to communicate in real-time withtheir managers. For Transport Managers, Vehco Vision is a stable link to manage drivers (sending of missions and messages inside the cabin, times follow up), to enhance workflows (detailed reports on activities) and to improve the organisation of transport missions (mission follow-up in real-time). Vehco Vision is used together with Vehco Connect to benefit from a connection to the vehicle and the tachograph. This solution makes all key data for a complete analysis of your transport activities available in Co-Driver.